The Marc Jacobs line of perfumes successfully mixes cutesy fun bottles (it’s pretty impossible not to coo at the vinyl flowers that adorn the tops of both Daisy and Lola) with easy, fancy-free fragrances that suit pretty much any occasion. They may not be examples of high-art perfume but slot nicely into the category of well-constructed and enjoyable designer scents with a good sense of fun. 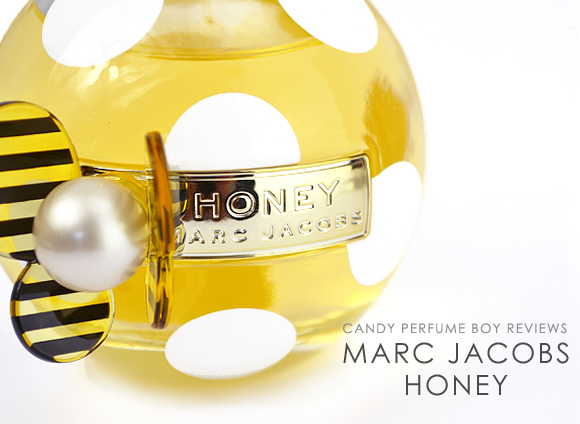 Jacobs’ latest perfume – ‘ Marc Jacobs Honey’ – is perhaps the best example of the brand’s happy-go-lucky vibe. As a flanker to last year’s Dot (an aquatic, woody floral) Honey takes on the theme of vibrant polka dots but in a sunnier, sweeter and warmer manner. I’d even go as far to say that it is perhaps the most sunny and happy scent to be launched by the brand so far. 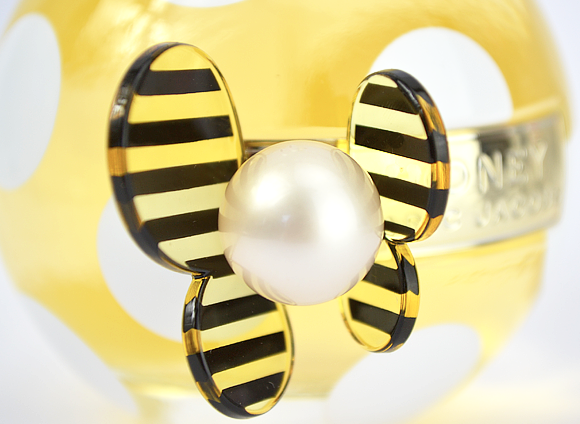 Marc Jacobs Honey, created by perfumer Annie Buzantian (also responsible for Dot) opens with a cocktail of fruit notes. Peach dominates from the outset, with mandarin and apricot in supporting roles and together the fruits are crisp, sweet and dewy. There is a subtle, syrupy and almost honeyed quality that is evocative of a delicate fruit coulis and never feels sickly, sticky or overbearing. As it settles on the skin Honey becomes increasingly more honeyed but in keeping with its sister Dot, it manages to do this in a translucent way thanks to a veil of silvery musk that gives both lift and vibrancy. The musk also allows for the nectarous nature of the fruit to carry right through the core of the fragrance, lasting right into the dry down. Vanilla plays a big part in the base, creating a pillowy resting place upon which the fruits, musks and woods can sit. There is a soft creaminess to the vanilla that plays nicely with the velvety musk and syrup-soaked fruits but it is too delicate to be described as edible or gourmand and the balance is well played out enough to ensure that Honey is a well-rounded composition. Honey is a fragrance that is easy to get along with – it wont demand too much of your attention and wont take any away from you either, allowing for your personality to shine through. What it does do, and it does so rather nicely, is cast a sunny and vivacious glow on to the skin that gives the impression of someone who has a wonderfully positive outlook on life – someone who adores bright fashion, bright fragrance and bright times. If you have a thirst for all that is vibrant, sunny & fun and find those vinyl flower adorned bottles irresistible then Honey may just hum a little ditty that you will love. After all, it’s kind of hard not to fall for her cheeky charm! This entry was posted on Wednesday, July 24th, 2013 at 9:00 am and is filed under Candy Perfume Boy, Fragrance, Guest bloggers, Tried & Tested. You can follow any responses to this entry through the RSS 2.0 feed. You can skip to the end and leave a response. Pinging is currently not allowed. I don’t normally go for honey scents, but the other notes you mentioned got me curious.